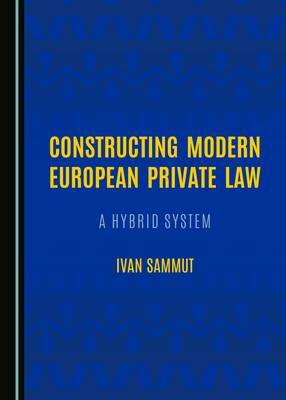 The Europeanisation of European Private Law (EPL) is an ongoing process that has gained momentum with the communautarisation of judicial cooperation in civil and commercial matters with the Amsterdam Treaty. This work examines the governance structure of EPL. It proves that more can be achieved towards the Europeanisation of private law through a new approach involving innovative modes of governance in EPL. In order to test this hypothesis, it is necessary to look at this exercise from three different angles. The first angle provides a study about the tools and the context with which one can further Europeanise private law and bridge the gaps between the main legal families, common law and civil law. The second angle encompasses a study of what has and what has not been achieved in the development of EPL by looking at both EU and non-EU initiatives. The final angle then examines the role of governance in the future development of EPL. As such, this study confirms that the further Europeanisation of EPL requires a multi-level mode of governance, confirming the traditional supra-national Community Method mode of governance in EPL with the introduction of intra-governmental innovative methods in EPL such as the Open Method of Coordination (OMC) and soft-law. These innovative modes, together with the traditional mode of governance, can take forward the development of EPL so that it can better serve the needs of the European legal community in the future.